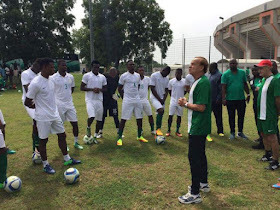 The Minister of Sports and Youth Development, Solomon Dalung yesterday said that the President, Muhammadu Buhari has approved the needed fund for Super Eagles clash with the Zambia National team on Sunday. Reports were rife of the unavailability of funds by the Nigerian Football Federation to fly the National team for the crucial World Cup Qualifier but the NFF vehemently denied. Speaking with newsmen at the National Secretariat of the All Progressives Congress ( APC), the Minister apparently admitted that the ministry and the football federation were having financial challenges hence the need to approach the President for financial assistance. Nigeria is in group D alongside Algeria, Cameroon and Zambia. He said: “I think that yes we are facing economic challenges, but the President have been quite supportive. He explained that “because of the love of sports and football in Nigeria, Nigerians do not usually want anything to be left to chance. So the reaction of Nigerians is just to put us sports administrators on our toes that we must get everything right. “I will be travelling along with the team to give them the moral and physical support as they kick start their campaign. I don’t think that if I would be travelling with the team, the position would still be seems as not too clear whether the team would travel. While speaking on the report that the Sport Ministry has not found it worthy to reward Nigeria’s Paraolympians at the just concluded Rio Olympic Games, Dalung noted that the athletes were ‘handsomely’ rewarded as against what was being reported.